Haomei Aluminum has built a hot tandem rolling production line, which has achieved good results after putting into operation, then what are the advantages of hot-rolled aluminum plate? haomei Aluminum for you makes a detailed answer. Hot rolling can significantly reduce energy consumption and reduce costs. Metal hot rolling high plasticity, low deformation resistance, greatly reducing the metal deformation energy consumption. Hot rolling can improve the processing performance of metals and alloys. That is to say, the coarse grains in the casting state are crushed, the significant cracks are healed, the casting defects are reduced or eliminated, the as-cast structure is transformed into the deformed structure and the processing performance of the alloy is improved. Hot rolling usually adopts large ingot and large reduction rolling, which not only improves the production efficiency, but also creates the conditions for improving the rolling speed and realizing the continuity and automation of the rolling process. Hot rolling can not very precisely control the mechanical properties required for the product, and the hot-rolled products can not be homogenized in their microstructure and properties. Its strength index is lower than cold work hardening products, but higher than completely annealed products; plasticity index is higher than cold work hardening products, but lower than completely annealed products. Thickness of hot-rolled products is difficult to control the thickness of the control accuracy is relatively poor; hot-rolled products on the surface of the rough rolling Ra value is generally 0.5 ~ 1.5μm. 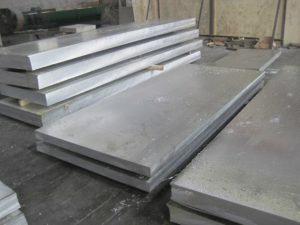 Therefore, the hot-rolled products are generally more as cold-rolled blanks. This entry was posted in Aluminum Sheet and tagged hot-rolled aluminum plate. Bookmark the permalink.